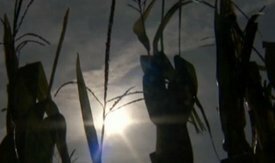 While the historic drought that has plagued the Midwest for months wreaks havoc upon many conventional farmers' soil, organic farmers are saying it is not conventional farming or genetically modified crops that will save agriculture from the effects of climate change. Rather, organic farming is the best way forward to be resilient in the age of climate change. As Mother Jones writer Tom Philpott has written, the drought has laid bare the failure of industrial, or conventional farming. "The message from the Midwest is clear: Chemical-intensive, industrial-scale farming is vulnerable to spells of hot, dry weather—some of the very conditions we can expect to become common as the climate warms," writes Philpott. University of Illinois small farm advisor James Theuri tells Al Jazeera that organic farming can beat those vulnerabilities. "If indeed we are going to see a climate change and we are going to see less of rain," says Theuri, "organically managed soils will definitely have advantages over conventionally managed soils." Of conventional farming, he says, "We are destroying life below ground." Unlike industrial farming, organic farmers' soil conservation techniques are better prepared to weather droughts. Jonathan Foley, director of the Institute on the Environment at the University of the Minnesota, has noted that "decades of industrial farming have depleted the natural organic matter (and 'tilth') of many Midwestern soils, reducing their ability to absorb and store moisture. Fortunately, no-till agriculture and organic farming practices can restore the health of the soil, and greatly improve the resilience of crops to extreme weather." Organic farmer Molly Breslin tells Al Jazeera, "A lot of people say organic food can't feed the world, and my response is, if we put as much money into research for organic agriculture research as we do for conventional agriculture, then I think that that would probably be a different story."